This TransLucite ® Plaque is elevated 1/2” from the wall creating a floating effect. This is a simple display solution creating visual impact for any patent wall or in other areas of your office. It has a clear 12 x 15 Lucite backing with a clear 11 x 14 Lucite layer on top. 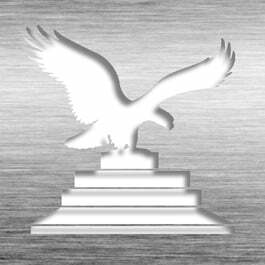 The Silver HD Plate is mounted on two 3/16" beveled Lucite ® plaques and accented with Euro-style metal caps and stand-offs. This plaque is elevated from the wall creating amazing dimension. Hardware is available in three premium metal finishes: Chrome, Gold, and Satin Silver. Also available in smaller 11" x 14" size and/or with a single Lucite® layer. Also available in our Gold HD Plate. This Patent Plaque - TransLucite® CL2-EZ15 is part of our Modern HQ Series of products, check out other products & options available in the Modern HQ Series of our selection. 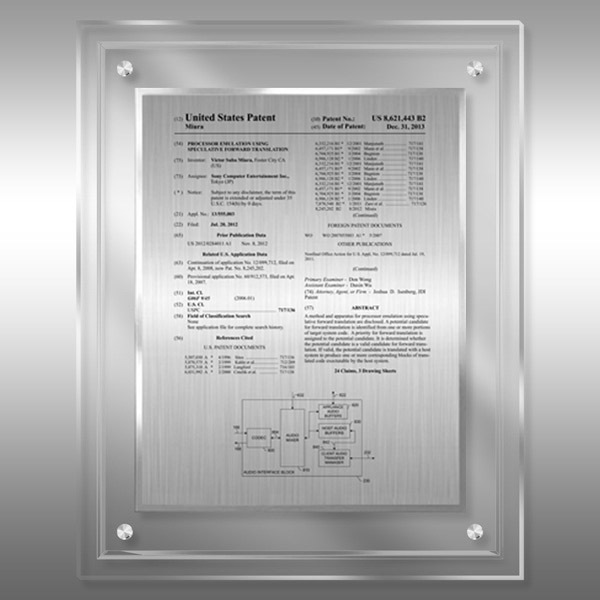 This Patent Plaque - TransLucite® CL2-EZ15 can be modified to your requirements and is available for your corporate award programs.